In a very enjoyable conversation I had the other day with a friend, we discussed hair color and fashion. I can't speak for her, but let it be said, I am quite the fashionista! I have received compliments on the same style for nearly twenty years, now. I've worn the same type of skirts for so many years, they came back in style! Good news today, I discovered my healthy shoe style is back on the shelves as well. This is not self-deprecating humor. I truly do like the style of clothes I wear, and I hate to shop . . . As for my shoes, I mentioned that in my last book, "Wilt Thou Be Made Whole?" I wouldn't call it a shoe obsession, as G-d simply called it idolatry. I had a different pair of shoes for every outfit and every occasion! The Creator of the universe informed me, it was a form of idolatry. Plus, He had given me a very specific dream about a pair of shoes to I was to make, as I was praying to be able to walk again. I've spent a couple of seasons in a wheel chair due to MS, but glory to Abba, it's been several years since the last bout. I know I've mentioned my balance is not great, but this particular shoe, that at one time I found so ugly, has been all I've worn for several years now. 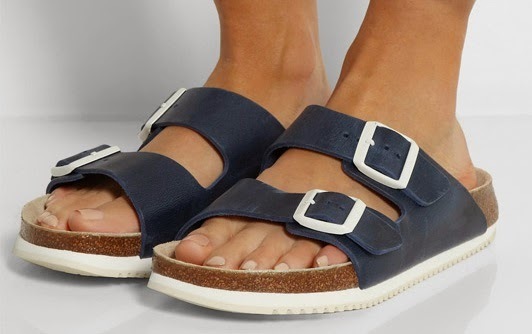 When I first saw the Birkenstocks, I wanted no part of that shoe, but that was what the shoe in my dream looked like. Now those wide strapped clunky sandals are my primary shoes. Most of the time I'm barefoot, and a month or so in the winter, I need boots, but 11 months of the year, in public I'm in those sandals, yet I digress. As my friend and I were talking, the Scriptural reference to clothes and shoes not wearing out came into the conversation. What a blessing it is to still be wearing clothes that I bought in a Thrift Store over 15 years ago. My town shoes are well into their second decade, but my chore shoes do wear out. I think I've been through three pairs of chore sandals as I enter my tenth year of homesteading. Considering the fact, at this time, my chore shoes do still wear out, I can still find replacements, and I'm believing when the time comes that believers cannot buy and sell without a mark, the chore shoes won't wear out til my work here on earth is done!